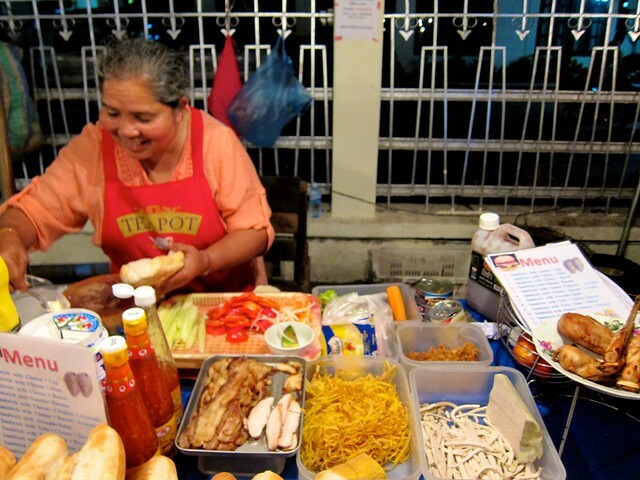 A culinary tour of Laos – snackettes. 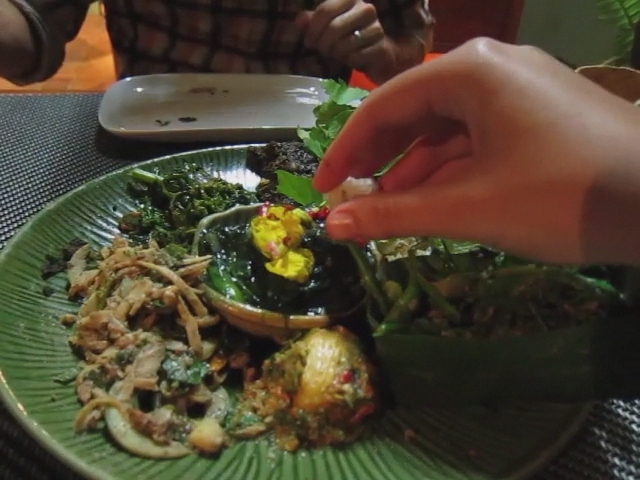 Like any good city, Luang Prabang was filled with new, weird, and potentially scary foods for us to try. 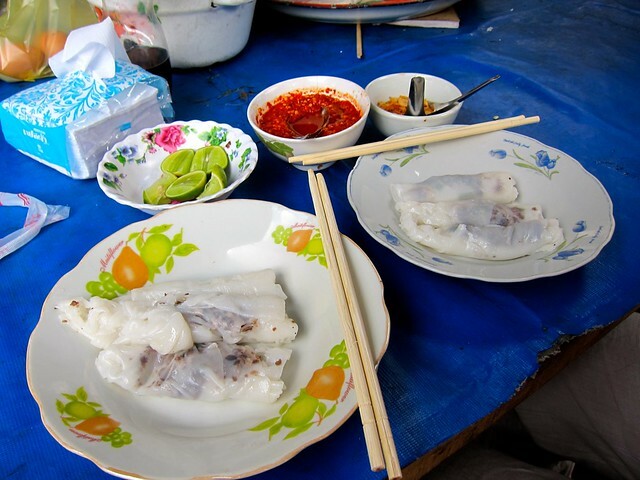 The first thing we did when we arrived in the city was to head straight for the morning market, where we could see what the city was all about. 1-Bright green egg shaped ball was a manicot seed, just there for display. 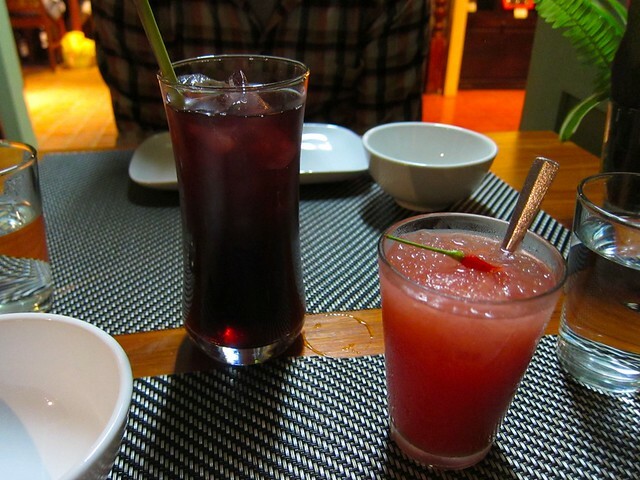 The flesh of the seed was pulled out and mashed with loads of red chilies (right behind the seed in the pic). One bite of the flesh, and Scott and I looked at each other in utter shock while our minds tried to process this new and strange food on our tastebuds. It was the sourest taste that I promise anyone reading this has ever tasted, ever – unless you have had this dish, that is. It was an extremely intense sour flavor (but not in a bad way) that completely overtook all of our senses, as if all of the sourness in the world had been boiled down and concentrated into this one bite. Not bad, not my favorite thing either, just plain bizarre. And did I mention sour? 2- Stir fried bamboo with onions and herbs. Light tangy flavor, pretty good. 3- Dried river weed (type of seaweed). This was my favorite dish on this plate. Subtle, nice seaweed flavor. Easy to like. 4- Stir-fried morning glories in oyster sauce. Like any stir-fried greens. Good rich salty flavor. 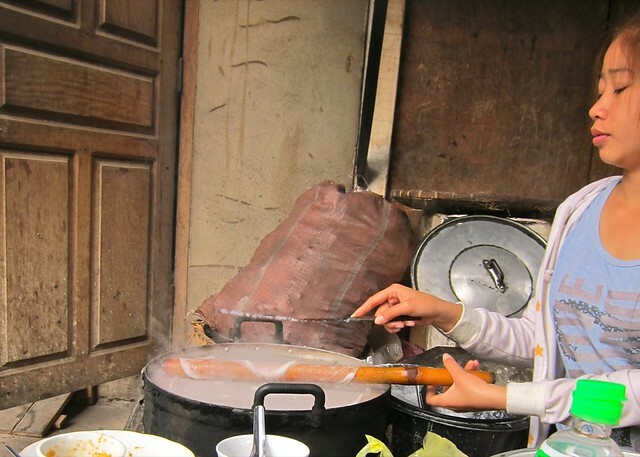 5- Mashed lotus flower paste. Again, really strong sour flavors. But not as intense as the manicot by a long shot. 7- Strips of soft, plump buffalo skin tossed in ground rice powder. Tasted like chewy gluttonous pork with a slight bacon flavor tossed in a nutty powder. One of my favorites of the night! 8- Stir fried greens, including pea shoots. Palate cleanser: free shots of honey-lime Lao Lao! Woohoo! The second course was the meat-heavy part of the meal. This is where the real fun (or should I say sheer terror..same thing?) began…. First, we were served two soups. 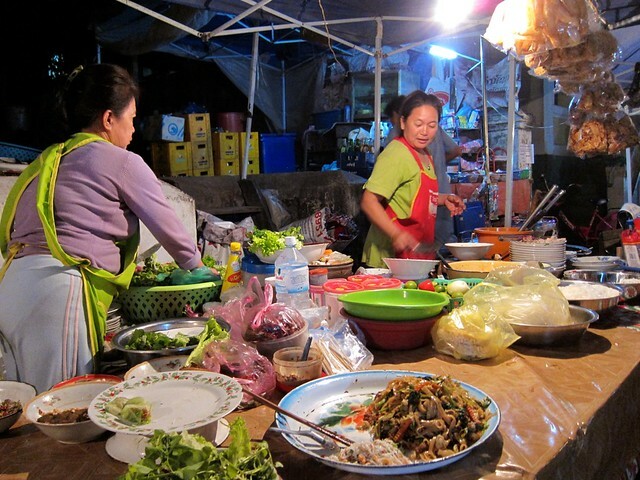 On the left, harmless chicken curry soup (full of all the “good” parts, of course…nubbins, organs, vertebrae….). On the right, python soup! Now, most of you may know that I am deathly afraid of snakes. 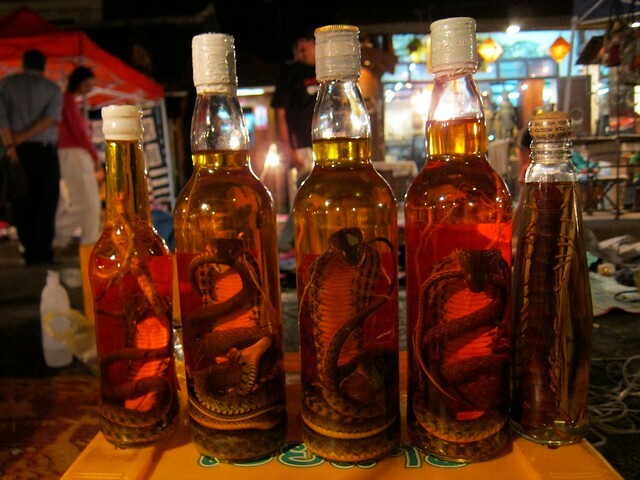 In fact, at the night market, I almost dropped the bottle of snake whisky as I was looking at it, even though I knew darn good and well what was in it before I picked it up and that the offending specimen was in fact dead. To have pieces of python set down in front of me, and be told that I would now have to eat it, sent my heart racing and my palms sweating furiously. At first, I really couldn’t even touch the bowl that it was in. But eventually, foodie prowess overcame fear, and I found myself diving in head first. The snake tasted like dark chicken meat covered in tough scales, and the soup was delicious and salty. This was one of the overall favorite dishes of the night for both Scott and me. 1- White bowl: bamboo soup. Pretty standard vegetable soup. This was the one “safe” dish that we could go back to in between the scary dishes. 2- Stir fried whole chopped frog (not just the legs, folks) with peppers, onions, and loads of garlic. If you look closely, you can see the slimy skin and some bones. One of Scott’s favorite dishes. 3- In the middle, sausage-stuffed banana flowers. Very good. 5- Gray mush at the back of the plate: mashed up tadpoles!!! Like you would expect, this was super fishy and a little “muddy” tasting. Hard to take more than one bite. Really fun to try once though. 6- On top of the cucumbers: buffalo stomach, cut up into strips and tossed with chilies and green herbs. A little gamey, but good. Tasted like, well, buffalo. 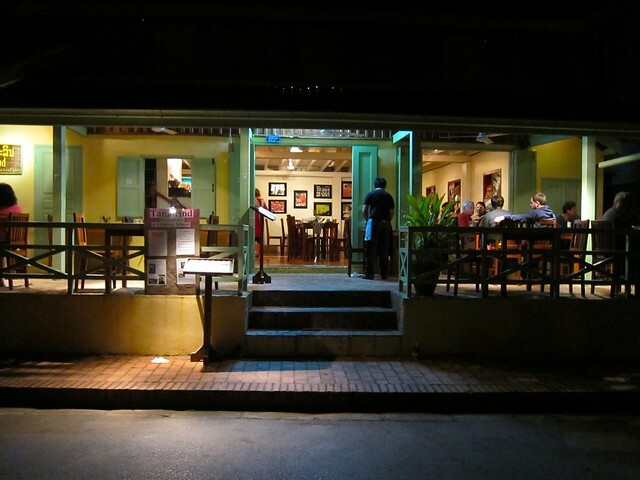 By the time we rolled ourselves out of Tamarind, we were pleasantly surprised that the dishes that we had been given were not just presented to us for shock or “weird factor” but were traditional, everyday dishes. 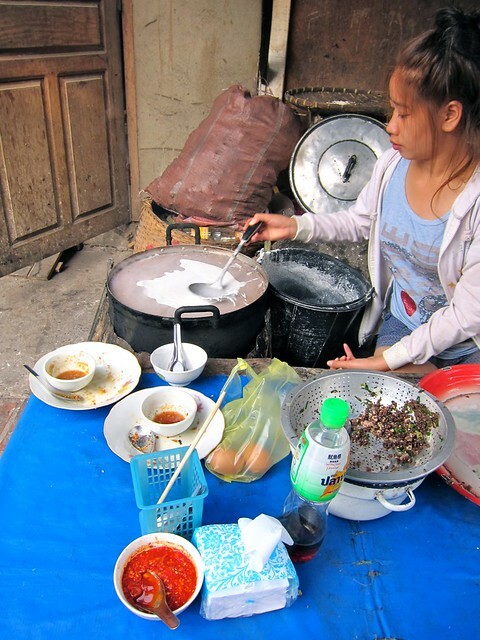 Some of the dishes (the buffalo stomach, for example) would be for special occasions; others (the manicot paste and lotus paste) were eaten every day in typical Lao households; some of them were delicious, others I would never want to see again – but really, that’s not what’s important. At some point, eating becomes not just about calories but about going beyond our comfort zone and about delving a little deeper into another culture. Delicious or detestable, unfamiliar or even downright scary, it will always be rewarding. It’s a good thing you are young!